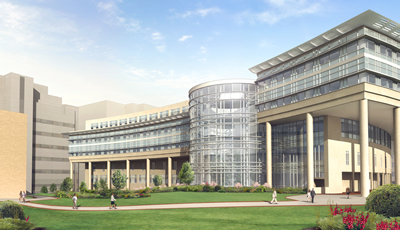 The University of Michigan Health System’s Cardiovascular Center will be a leader in patient centered care as one of the nations first fully comprehensive cardiovascular treatment centers. Housed within the 350,000 gross square foot facility consisting of 6 floors and 2 building support basement levels will be 3 ambulatory care clinic modules, non-invasive diagnostic and testing suites, 5 cardiac catheterization labs, 5 electrophysiology labs, 8 operating rooms specializing in cardiac, vascular and interventional radiology procedures, 20 intensive care beds and office space for clinical faculty and support staff. To prepare for the future needs of the center, shelled spaces for 2 operating rooms, 2 cardiac catheterization and/or electrophysiology labs, 4 intensive care beds and a 24 bed acute care unit are included in the plan, for a total of 426 GSF. The building will be located just south of the Cancer & Geriatrics Center and University Hospital, on the site of the “Old Main” hospital. Its entrance will be located at the intersection of Observatory and Ann Streets. Pedestrian connectors from the Cardiovascular Center to adjacent medical center buildings are planned for to facilitate the use of shared services and materiel handling. To provide parking for patients and staff a 465 space parking structure will be constructed as a part of this project. The above rendering was shown to the Regents at the May 2003 meeting.